No doubt this issue has more than you will care to read at one time, so stow it in a safe place on your computer or simply go to the website blog page www.lilburncp.com to retrieve it later. 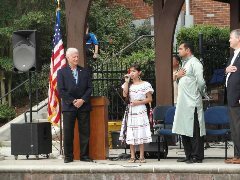 The first Small Town Big World Festival held on September 13 was a resounding success. 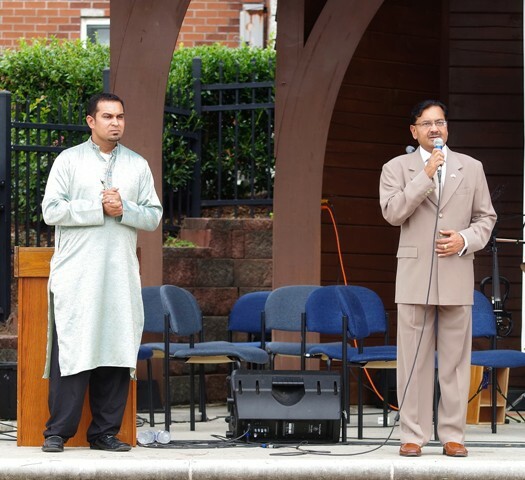 A crowd of 5,000 attended the four hour event which began with the Parade of Flags and Opening Ceremonies which included comments from Congressman Rob Woodall, State House Representative B. J. Pak, Commission Chair Charlotte Nash, Mayor Pro-tem Tim Dunn and Consul General Ajit Kumar of India. 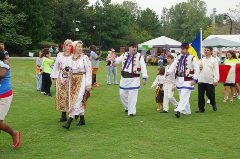 Following the Opening Ceremonies attendees were entertained by traditional and contemporary dance and musical selections. Exhibitors from community youth organizations, churches, nonprofits, businesses, and schools provided information, crafts, games and demonstrations. Topping it off were American and international food vendors and a children's play area. Vida Radio broadcasted remotely from the event. Pictures tell the story - see the picture gallery and related stories throughout this issue. The Festival Committee, chaired by Rick Desai, consisted of members: Diana Preston, Margot Ashley, Susan Rumble, Leslie Edwin, Elaine Brown, Sylvia Goalen, Scott Kimball, Jeannie Mullins, Wanda Price and Camissa McCurdy. The event was co-sponsored by the City of Lilburn and the Lilburn Community Partnership with major organizational and logistical support from SafetySmart Lilburn. 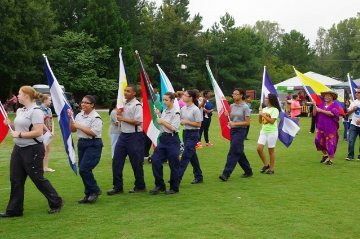 Numerous volunteers came from First Baptist Lilburn Church, the Knights of Columbus, Berkmar High School, Parkview High School Marine ROTC, and Lilburn Police Department Explorers Post as well as general community volunteers. Festival Survey: Did you attend? Please take our survey and give is your feedback as we begin planning next year's event: Attendee Link Were you a participant, performer, exhibitor or vendor? Participant Link. Business After Hours sponsored by Lilburn Community Partnership and under the leadership of Board Member Michael Taylor has announced its schedule for the 2014-15 year. 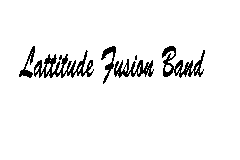 The first BAH for the new season will be held from 6:30 pm until 8:00 pm at Taste of Paradise Cafe in the Market Place Shopping Center at 4805 Lawrenceville Hwy. (at the intersection of Hwy 29 and Killian Hill Rd.). 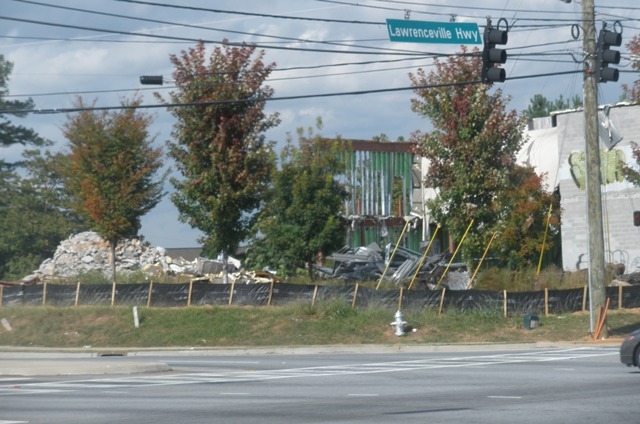 So much is happening in our Lilburn Community in terms of redevelopment that LCP strongly encourages business operators and residents to attend the October 21st event. There will be time for "meet and greet." A presentation on City and Lilburn CID project updates will follow featuring Lilburn Economic Director Doug Stacks and Lilburn CID Executive Director Gerald McDowell. Drawings for door prizes will conclude the program. Business operators may bring a door prize and will have the opportunity to introduce their business as they host the drawing. So make plans now to meet your neighbors and business owners at the Tuesday, Oct. 21 Business After Hours. 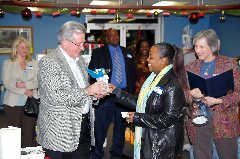 Future Business After Hours will be scheduled the third Tuesday evenings of January, March, May, August and October of 2015. Locations and programs are to be determined. If you would like to host or suggest a program of interest, please contact Michael Taylor a mtaylor@bellsouth.net. For past BAH photos, check the LCP Facebook photo album. The Gwinnett Food Swap will be hosting a special food event on October 26 from 3:00-4:30pm at the Wynne-Russell House. A Girl Scout tradition, Gross Goodies features foods that look disgusting but are actually quite tasty. Think kitty litter-topped cakes (crumbled cookies), doll bodies filled with guacamole, meatball rats, etc. Tons of ideas can be found on Google and Pinterest. Girl Scouts and guests of the Gwinnett Food Swap (and especially children) are encouraged to bring zipper bags to collect swapped treats to take home. Costumes are welcome. To register or for more information, contact Leslie Edwin at blueofnoon@hotmail.com or 404-791-5483, or visit the Food Swap's Facebook page at facebook.com/gwinnettfoodswap. Schedule your family photo for the holidays in an historic,1826 farm house. This year the Wynne Russell House will be decorated for holiday family photos and tours on Saturday, Nov. 8 from 10 am until 2 pm. The LCP invites your to schedule a family photo in front of this back-in-time fireplace. While at the home, come prepared to purchase holiday crafts and baked goods. 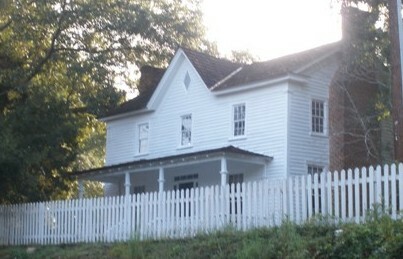 The Wynne-Russell House is located just off Hwy 29 in Lilburn at 4685 Wynne Russell Dr. Photographer Valerie Payne will be taking digital photos ideal for Christmas and Holiday greeting cards and family albums. Email info@lilburncp.com to reserve a 15 minute time slot or take your chances and drop in. Ms. Payne will make the digital photos available to you for printing, etc. Suggested donation is $5 per person in the photo. In addition to the photo sessions, we have invited crafters and home bakers to offer holiday items and baked goods. Tours of the house and cemetery will also be given. 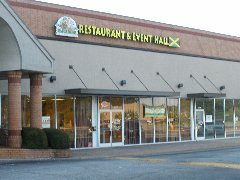 For vendor information go to LilburnEvents.com. Funds raised will benefit the repair and maintenance of the Wynne-Russell Historical House. Donations to the Lilburn Community Partnership are tax deductible. We welcome your support of this community treasure. The Wynne Russell House is a hidden gem in Lilburn and is beginning to shine thanks to the City and volunteers. The house built in 1826, is on the Registry of Historical Places and just got a new coat of paint by the City. Recently Miriam Vega and her AllState office staff volunteered for a grounds clean-up and beautification morning. Their time and expertise at planting, trimming and yard clean up have really helped to put a shine on the house and grounds. While these efforts have helped get the house and grounds ready for hosting events and meetings, there is still more to do. If you are interested in helping to restore this historical Lilburn treasure, come out for another clean-up on Saturday, Nov. 1 from 9 am until noon. Bring your gloves and clippers. The house is located at 4685 Wynne Russell Drive in Lilburn. The Lilburn Daze Arts and Crafts Festival is right around the corner on Oct. 11. A Lilburn tradition for over 40 years, Lilburn Daze features more than 200 arts and crafts vendors. There also will be a variety of food vendors, a kid zone featuring free art activities, a train ride, pony rides, and lots of other fun for the children. New this year will be food trucks -- including breakfast! -along with numerous new crafters and an expanded children’s area. Come out and find your favorite jewelry, pottery, baskets, wire sculpture, bottle art, and much more. Don’t forget to stop by the Boy Scouts booth for your kettle corn. 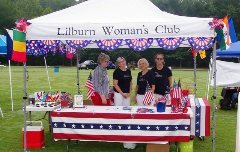 Lilburn Daze is hosted by the Lilburn Woman's Club and co-sponsored by the City of Lilburn. Enjoy dinner and music in the park! Second Tuesday in October from 6-9 p.m.
Redbird Events in partnership with Cirque du Soleil will be giving away one pair of tickets to the new show, Amaluna, opening in Atlanta on Friday, October 3rd at Atlantic Station! Come to Lilburn Food Truck Tuesday on October 14 to enter for a chance to win these great tickets! The line-up for Tuesday, October 14 includes Blaxican Food Truck, Ibiza Bites, MIX'd UP, The Mobile Marlay Food Truck, Pressed for Time, WOW! Food Truck, Yumbii, King of Pops, and Yum Yum Dessert Co. While having dinner in the park, you can enjoy live music from Highbeams! Join this 5K event to help raise money for a student mission trip in 2015. Providence Christian Academy & Cristo Vive Church are hosting the Youth Mission 5K Run! This 5K event will begin and end in the overflow parking area across from City Hall. 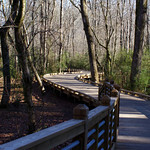 Runners and walkers will travel along Camp Creek Greenway Trail at 9 am - 11:am. For more information about this event, please email tony@cristovive.com or contact him: 404-512-1985. The City of Lilburn is coordinating a costume swap at Music on Main Street Fall Festival. Recycle and reuse! Join the City of Lilburn’s Halloween Costume Swap on Saturday, October 18 from 12-3 p.m.
Bring your clean, gently used children’s costume to Music on Main Street during their Fall Festival on October 18 and swap it out for a new-to-you costume! There’s no cost to participate. Simply bring a children's Halloween costume you’re no longer using & pick a costume from the rack to take home. Just have a gently used children's costume you’d like to donate for the event? That’s fine too! For information about the Costume Swap or to donate a costume, please call 770-638-2225. If you'd like more information about the Fall Festival, please contact Music on Main Street at 770-609-6393. This annual fundraiser will include pet adoptions and a pet hike. Free admission with a pet food donation. Visit vendor booths and enjoy live music! City Park. Time: 10:00 am - 5:00 pm. For more information, please visit www.daffysday.org. Street pianos are coming to Old Town Lilburn! At the Lilburn Daze Arts and Crafts Festival. At 9:am on Oct. 11, the City of Lilburn will unveil the first piano in this new public art project. 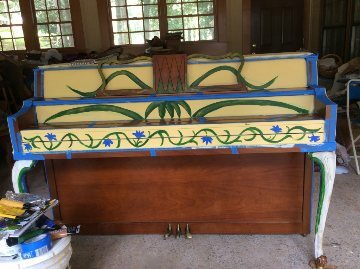 Lilburn painter Jan Clifton Watford has turned a Queen Anne style piano into a beautiful canvas of flowers. The piano will be placed on the band shell in Lilburn City Park with an open invitation for anyone to sit down and play a song. 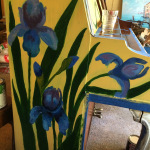 Follow Jan Clifton Watford’s blog on the project and come to Lilburn Daze to see the finished work of art. 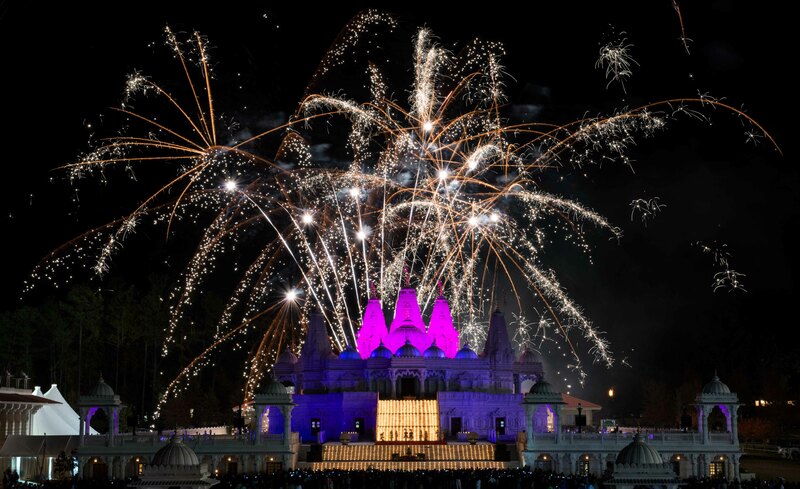 Every fall according to a lunar schedule the BAPS Mandir puts on an incredible show of fireworks for the community. This year the Festival of Lights occurs on Saturday, Oct. 25. Go to the BAPS website for more information. Click on the picture for a YouTube video of 2011 Diwali fireworks display. 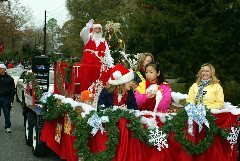 Join your friends and neighbors as the City of Lilburn proudly presents the annual Lilburn Christmas Parade on Saturday, December 6. This year's parade theme is "Christmas Around the World". The parade begins at 10 a.m., winding down Main Street to Lilburn City Hall. Following the parade, parents are welcome to take pictures of their children visiting with Santa. Main Street is closed between Lula and First Avenue for sewer line installation, and at times the construction will extend all the way through Old Town to Railroad Avenue. Construction will be Monday - Friday until about 5 p.m. for about 8 weeks, which is just before Thanksgiving. Trenches will be filled daily at 5 p.m. (or when crews finish work) for full access. Every Friday, the trenches will be paved with asphalt (unless it rains on Friday). 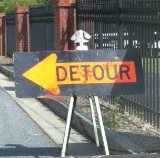 Main Street detours: Northbound Main Street thru-traffic is diverted onto First Avenue, then onto Lula Street and back to Main Street. The southbound Main Street thru-traffic is diverted in the opposite direction onto Lula Street, then onto First Avenue and back to Main Street. Even though Main Street will be closed, the businesses are open. While you may not be able to park in front of the downtown shops, there is nearby parking in the City parking lots. Show your love for our Lilburn downtown businesses and don't let this temporary detour stop you from supporting our business owners. Have you noticed anything different at the intersection of Pleasant Hill and '29? The green monster building is gone! While some thought it might make a good movie set for the Walking Dead, it is too late. 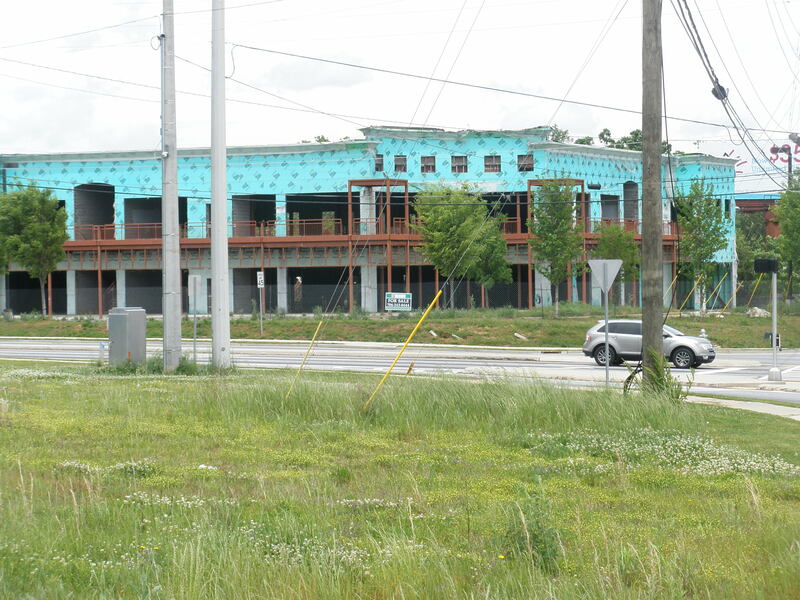 Aldi has submitted permits to build a nice building with landscape plans, etc. Thank you Aldi! The City of Lilburn will hold a special election on Nov. 4, 2014, to fill the vacant Post 1 seat on City Council. Qualifying was Aug. 25-29. Michelle West and Teresa A. Czyz have qualified to run for the seat. The polls will be open on Election Day, Nov. 4, from 7 a.m. until 7 p.m. All voting takes place at City Hall, 76 Main St., Lilburn, regardless of a city resident's assigned county polling place. Only registered voters who live inside the city limits will be eligible to vote in this municipal election. For more info on City News, visit the web site as well as Facebook. Gerald McDowell, Executive Director of the Lilburn CID has been busy during the last few months leading the Design29 Study Committee. The Committee, comprised of community stakeholders and state and county officials, has been working with engineers from Stantec to determine what can be done to improve curb appeal and pedestrian and vehicle safety along the Hwy. 29 corridor. The Committee is now soliciting input from the community. There will be a public workshop on November 6thfrom 6:30 pm to 8 pm in the Media Center of Providence High School. Don't miss this opportunity to provide input. The recent Small Town Big World Festival was a success largely because local businesses stepped up to help provide a free event for the community. 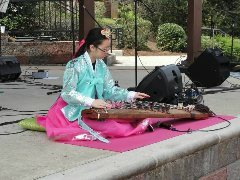 Platinum sponsors were Nam Dae Mun Farmers Market and Miriam Vega AllState Insurance Agency. Patrons and Friends were: Eddie's Automotive, Sterling Paint and construction, Bill Head Funeral Home, and Batterton Dentistry. Please consider these businesses for goods and services. "The Lil' Barn." That's not all that's new. Check out their growler bar. What's a growler? It's a refillable jug for craft beers. This is an interesting concept that appeals to those who like to try different craft beers at home rather than sitting in a bar or restaurant. According to Bill Shriver, on-site manager, the jugs retain pressure, and the beer stays fresh for a quite a while if refrigerated. The Lil' Barn has 16 craft beers on tap in its new bar area including alcohol-free root beer sweetened with cane sugar. Owner John Souter has also redone the menu adding a great steakburger to his already popular wings and seafood. October Clearance Sale: 50% off shrubs, trees, perennials and more. Friday thru Sun. October 10, 11, & 12 - Sat. 8 am - 5 pm, Sun. 12-4 pm. 770-921-6485 5444Lawrenceville Hwy. www.doroughlandscape.com. Bambinelli's will no longer have direct mail coupons. Instead of waiting for paper coupons to come in the mail, they are now offering reusable Coupon Cards! Bambinelli's Coupon Cards can be used on dine in, carry out, or delivery orders! This card can be used as much as desired for one year after purchase! These cards are now available for purchase at Bambinelli's Lilburn for $20.Coupon cards purchased at Bambinelli's Lilburn are only valid at our Lilburn location and are not transferrable to the Northlake location. Coupon cards cannot be combined with any other offers or discounts including catering pricing. Only one coupon card may be used per check but multiple cards may be used per table. Berkmar High School's Work-Based Learning Program (WBL) provides opportunities for juniors and seniors to earn credit as they spend part of the school day gaining work experience in paid and unpaid internships with local businesses. For more information contact Dr. Gail Green at gail_green@gwinnett.12.ga.us or770-806-3898. * For more notices, check the Community Bulletin Board by following this LINK. You may also post your own item. Check the Advance In-person Voting Schedule for theNov. 4 General Election. 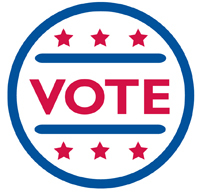 By following this LINK , you will find detailed information on voting locations, dates and times. The annual burn ban period came to a close on October 1, 2014. The Georgia Department of Natural Resources, Environmental Protection Division restricts open burning during warm weather months in metro Atlanta and larger counties to comply with Federal Clean Air Regulations. According to DNR, outdoor burning is a significant contributor of pollutants that can form unhealthy levels of ozone in the air. Residents who want to burn between October 1st and April 30th are required to follow the county ordinance restrictions that cover all types of outdoor burning.http://www.gwinnettcounty.com/static/departments/fire_emergency/pdf/outdoor_open_burning_brochure.pdf Follow this LINK for the information on outdoor fires. Lilburn Business Assoication (LBA) will have their monthly meeting on Tuesday, Oct. 21 at 11:30 am. Jim Bulger of WorkThrive, will be speaking on "Building Your Beach: Increasing Workforce Engagement to Achieve Business Goals." Fully catered lunch provided by Killian Hall • Where: 908 Killian Hill Road Lilburn, GA 30047 • Cost: $15 for non-members $12 for members. LINK. 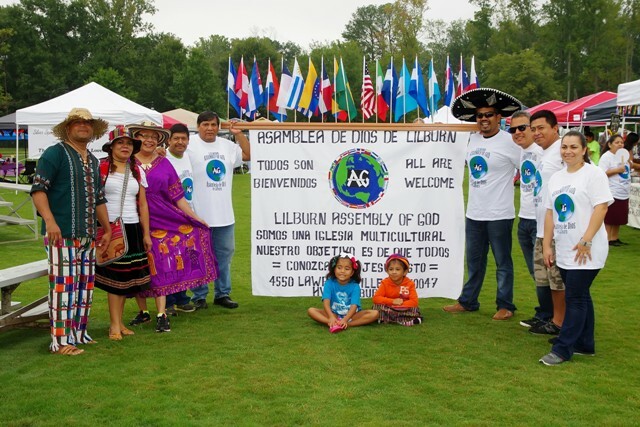 Even though members were busy planning this year's Lilburn Daze, the LWC participated in the recent Small Town Big World Festival on Sept. 13. 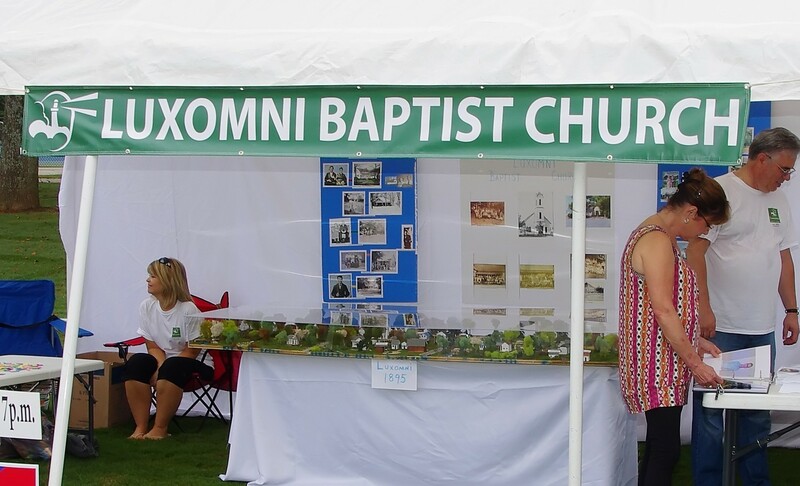 Several Conservation ladies also spruced up the mini-gardens in City Park recently in preparation for Lilburn Daze. Lilburn Daze: The LAA will be hosting an exhibit of our members art at this year's Lilburn Daze. There will be original artwork for sale in multiple mediums and prints, as well as 3D art. Be sure to visit our booth. 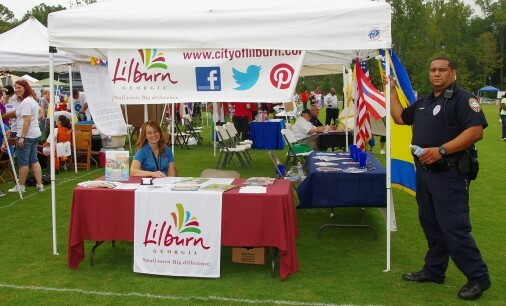 Lilburn Daze is Saturday, October 11th from 9AM to 5PM at Lilburn City Park, behind the City Hall. Painted Chair Sale at Lilburn Daze: The LAA has invited all members to "paint a chair". Come and see how an ordinary chair can be transformed into an original piece of art. These original art/painted chairs will be for sale at this year's Lilburn Daze. 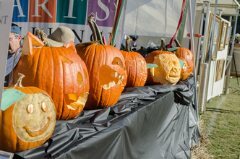 Pumpkin Carving Contest: The Lilburn Arts Alliance will be having our second annual pumpkin carving contest at Lilburn Daze festival this year. For contest rules and information, go to lilburnartsalliance.org. As an added attraction, last years's winner, Andy Triemer will be performing a 3D pumpkin carving demonstration during the festival. The Lilburn Arts Alliance welcomes mixed media and watercolor artist Susie Schklar, who will demonstrate ways to become a more confident, colorful and creative artist. Working in contemporary and abstract form, Susie Schklar expresses her compositions on canvas and paper. The meeting is Wednesday, November 12th, 7PM at the Lilburn City Hall, 76 Main Street. Fall Art Exhibit: On Saturday, November 15th, the Lilburn Arts Alliance will host their fall Art Exhibit at the Lilburn City Hall, 76 Main Street, from 11AM to 4PM. Stop by to see and buy original art by our creative artists. Works include paintings, photography, mixed media and 3-Dimensional art. This will be a fantastic opportunity to purchase art for the art lovers on your Christmas gift list. Local Art Exhibits: We are always looking for new venues to place our art. We are now showing our work at the Lilburn Library and at the Mountain Park Library. If you have a retail establishment in or around Lilburn, and would like to show original art on your walls, please contact Sabrena Hayat at sabrenahayat@hotmail.com or Peggy Sullens, President, at (770) 921-9440. Some years ago Lilburn had a Lions Club which was very active and had a tremendous impact on our growing Lilburn community. While the Club disbanded some years ago, it has certainly left its mark. The Lilburn Lions acquired the land for Lions Club Park which was for many years the only ball park and pool in the area. 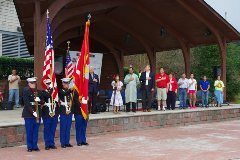 Later the Club donated the property to the City of Lilburn which later leased it to Gwinnett County and we now have a beautiful park that generations to come will enjoy. 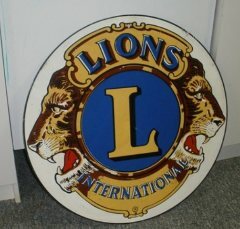 Pictured is the sign the Lions displayed in Lilburn in the 70's and was recently discovered in City storage. There seems to be some interest in bringing back a Lion's Club to Lilburn. Follow this LINK to find out more about the organization. If you are interested in helping to re-start a Club in the Lilburn area, email info@Lilburncp.com. The Gwinnett Coalition for Health and Human Services is a non-profit organization dedicated to addressing the health and human service needs of everyone in Gwinnett County, Georgia. It does so through collaborative community planning, applied research, community education, membership diversity, consensus building, advocacy, and innovation. 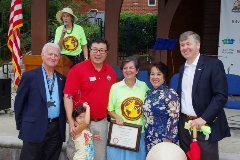 The organization sponsors Gwinnett Great Days of Service every year. This year's dates are Oct. 24 and 25. Go to this LINK to volunteer. Last spring, Berkmar's Digital Publishing Club came up with an idea to work with the Gwinnett Christian Terrace retirement home. Students worked closely with the residents, interviewing them and collecting photos, to create Life Legacy books for them. After fundraising, students published their books and presented them to the residents of the home. Ms. Kylie Hicken is the sponsor for Berkmar's Digital Publishing Club. Recently Lilburn Middle hosted a Community Partners meeting. Dr. Yvette Arthur led the meeting and reported the plans for the coming school year. Lilburn Middle, in addition to student achievemnet goals, is also working hard to involve parents and the business community in supporting their academic goals. They already have a large number of parents supporting the PTSA and Title I programs. They are now looking to the community for sponsors. If you are interested in supporting LMS as a business or community partner, contact Rene Macrae at: 770-921-1776. 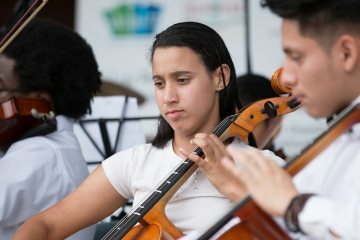 (pictured is the LMS orchestra performing at the Small Town, Big World Festival). 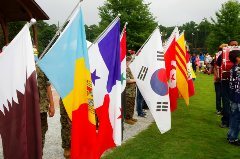 The Marine ROTC unit was a tremendous help at the Small Town, World Festival. This unit is called upon for a number of Lilburn events. 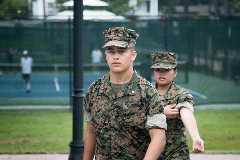 Maj. Ron Tootle directs the unit and has a strong parent support group to assist him. Please feel free to forward Lovin'Lilburn newsletter on to neighbors and friends. Click this LINK to find a translatable newsletter. Killian Hill & Arcado Rd.